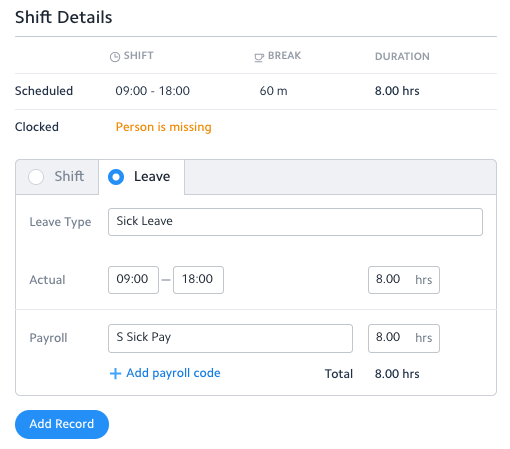 There are some instances where you need to change a Shift entry to a Leave entry, for example when an employee calls in sick. To change the entry, first click on the tile edit the details, pulling up a right hand window. Here you should see that the entry is marked as Shift. To convert the entry click the Leave tab heading. Next, click the drop down menu to select which type of leave the employee has taken, ensuring the hours are correct, and then clicking Save & Approve. This will now be documented as a Leave entry.